The British Sign Awards took place on November 8th, at Leicester’s Athena during the annual BSGA gala event. 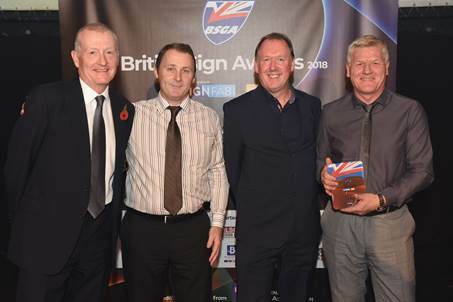 The BSGA is the trade association that represents and supports interests of the UK signage industry, to highlight British sign makers and to provide a showcase for the ‘Best of British’. Wilson Access sponsored the ‘Roll out programme of the year’ category which is for the implementation of a single, consistent signage scheme across multiple sites/buildings and was one of 15 award categories. In addition to hosting a table with a selection of their signage customers, Wilson Access took part in a networking session in the morning, where they had the opportunity to mix with key signage industry influencers; and showcase some of their track and truck mounted platforms. Truck and track mounts provide safe and effective working at height for the signage sector. Wilson Access provides flexible hire options through short or long-term contracts. Their range of self-drive truck mounts with reach heights up to 21m are popular within the signage sector and are chapter 8 compliant, ensuring best practice when working on jobs involving highways. For larger scale rebranding signage, their range of jumbo class truck mounts offer exceptional reach heights of up to 57m and class leading outreach of up to 41m. “We were delighted to be part of such a prestigious industry event and witness first-hand the remarkable achievements made by British sign making companies. The calibre of entrants was extremely high and gave all those who participated a chance to celebrate best-practice skills with like-minded creative peers. We offer congratulations to all of the winners, including Astley Signs who scooped our sponsored award “Roll out programme of the year’’.